A rich lineup supports the recycling of trees. Powered by a powerful environmentally friendly water cooled 4-cycle clean diesel engine. It processes branches and logs up to 172mm at an astonishing rate of 40m per minute. A centrifugal clutch transfers the power directly to the processing edge and ensures safe easy operatability. New Crawler system absorbs bumps and provides superior shock protection. All new 10.3kw (14hp) air cooled 404cc 4-cycle gasoline (petrol) engine. Equiped with a newly developed auto control hydraulic pressure sensing mechanism it processes branches up to 128mm thick up to an astounding rate of 22m per minute. Compact at (LxWxH) 1,730 x 870 x 1,330mm and weighing in at only 350kg makes it easy to transport, even with the lightest of trucks, and easy to store. Designed to be operated from the tray of a light truck or utility allowing for easy transportability. 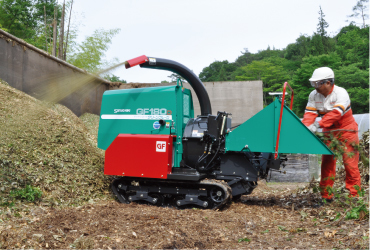 This compact chipper weighs only 345kg. Powered by a powerful 665cc air cooled gasoline (petrol) engine producing 16.1 kw. It powers through branches up to 120mm like a hot knife through butter at a rate of 25m per minute. 360 degree rotatable discharge chute allows yopu to operate freely from either side of your utility (vehicle). Mounted on your tractors 3 point hitch(linkage)and powered by your tractors PTO these chippers throught their simplicity,transportability and low maintenance requirements provide uncompromising cost performance. Designed for 18-44kw (25-60hp) tractors. Powered by your tractors PTO via a one way clutch PTo shaft this chipper processes logs and branches as thick as 172mm up to an amazing rate of 25m per minute. 360 degree rotatable 1,800mm discharge chute. Designed for 9.6-25kw (13-34hp) tractors this little work horse will power through logs and branches up to 117mm (11.7cm) thick at a rate up to 11m per minute. Compact (1,300 x 1,200 x 1,200mm) and weighing only 225kg this chipper is easy to transport as it is to store. Contact us for more infomation or an obligation free quote. The following demonstration videos (in WMV format) are available in broadband (high-definition) or narrowband (low-quality) mode. The Green Flaker plays an active part in the following cases. A capacity reduction of pruned branches of trees, such as garden trees at home and roadside trees. A capacity reduction of trimmed branches of roadside trees and others, such as those in public facilities. Crushing disposal of thinned wood collected from the mountains. Crushing disposal of pruned branches of fruit trees, such as apple, mandarin orange, and pear trees. 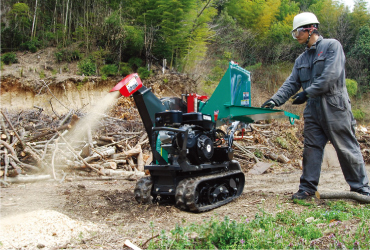 A capacity reduction of woody industrial wastes, such as scrap wood from construction and house demolition sites. Crushing disposal of waste materials after log processing. Crushing disposal of plants and fallen leaves. Crushing and capacity reduction of old rose trees. Crushing disposal of bamboo trees. Crushing disposal of pruned branches collected from chestnut gardens. Crushing disposal of pruned branches of trees on the exclusive roads and courses of golf clubs. Crushing wood pieces for growing shiitake mushrooms. Crushing disposal of residual tobacco plants. Crushing disposal of wood, such as driftwood at sluice gates of dams. Crushing disposal of corrugated paper and old newspaper. Processing of residual vines, such as tomato, melon, and watermelon vines. Crushing disposal of unnecessary scrap wood for charcoal materials. Crushing disposal of compost and feed bags. The Green Flaker is playing an active part in the following places. Crushed chips are recycled as explained below. Changing pruned and crushed trees and branches into compost and returning them to the ground. Changing pruned and crushed branches of fruit trees, such as apple, orange, and pear trees, into compost. Using crushed chips as moisture adjustment material for stock raising compost. Using crushed chips of woody industrial waste, such as house demolition waste, for mulching material and compost. 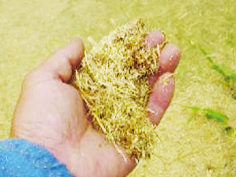 Using crushed chips for mulching material for promenades of golf courses and parks. Changing pruned branches of fruit trees, such as apple, orange, and pear trees, into mulching materials. Using crushed chips of bark for livestock litter trays. Using finely crushed chips (substitution of sawdust) for oil absorption mats. Mixing and using roughly and finely crushed chips for bacillus flooring material for mushroom cultivation. Roughly crushed chips for smoked chip material. Carbonizing and using roughly crushed chips for a sewage disposal agent. Carbonizing and using crushed chip for a soil improvement agent. Mulching and using crushed chips for weed deterrence material in woodlots. Mulching and using crushed chips on the roots of roadside trees for water holding, heat insulation, and for weed deterrence. 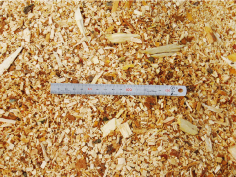 Using crushed chips as woody biomass fuel. Carbonizing and using crushed chips for humidity conditioning under floors. 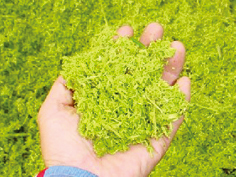 Using crushed chips as mat material for insect breeding. Mulching and using crushed chips for cushion material under outdoor play equipment. Mixing and changing crushed chips with kitchen garbage from restaurants into compost. Crushing and using corrugated paper and old newspaper for feces-and-urine moisture adjustment material. Crushing and changing residual vines, such as tomato, melon, and watermelon vines, into organic fertilizer and returning them to the ground. Crushing and changing rice straw, wheat straw, and old tatami mats into compost and returning them to the ground.